Our high-quality knife set offers the right knife for any task, and even comes with a stand and knife sharpener. The blades are made from stainless steel and coated with a non-stick coating paint. Their handles consist of PP. Chef Knife: A multi-functional knife with curved blade allowing the user to rock the knife for more precision. Its sharp edge cuts, chops and slices any kind of produce with ease. Carving Knife: Intended for cutting smaller and thinner slices of meat and fish. Bread Knife: Its scalloped and serrated blade cuts bread, burgers and pizza clean and effortless. Utility Knife: It is designed to cut all types of fruits and vegetables and remove fat or sinew from meat. Paring Knife: This knife is perfect for peeling, trimming and segmenting fruits and vegetables. Steak Knives: Fully serrated blade increases cutting efficiency and a curved handle to better adapt to your hand whilst cutting. Cheese Knife: Purpose designed for slicing and serving cheese. Pizza Knife: This knife has a curved serrated blade which makes it ideal for slicing pizza. Knife Sharpener: The set includes a knife sharpener with two sharpening modes, precision angle guides, and a V-Grip bottom for the use on an edge or counter. Its soft grip handle allows for control and comfortable use - also for lefthanders. Knife Stand: This stand holds all the knives in this set and keeps your kitchen clean and orderly. Internal enclosures prevent damage to the blades. ✅ALL-IN-ONE COMPLETE SET - A specialized set of kitchen knives for all your chopping needs. Includes 13 Professional Knives, kitchen scissors, bonus peeler, a premium quality 2-stage knife sharpener and a modern knife stand. A true cutlery organizer! ✅PROFESSIONAL QUALITY AT ITS BEST - The best materials to update your cooking! This stainless-steel knife set gives you superior blades coated with nonstick paint plus ergonomic PP handles. Sharp, sturdy & practical. No rust, stains or pitting here! ✅A MULTI-PURPOSE KITCHEN DÉCOR MUST - A perfect mix of design & practicality, featuring knives for all purposes: carving knife, utility knife, cheese knife, pizza knife, chef knife, bread knife, paring knife, steak knives. Excellent precision cutting! 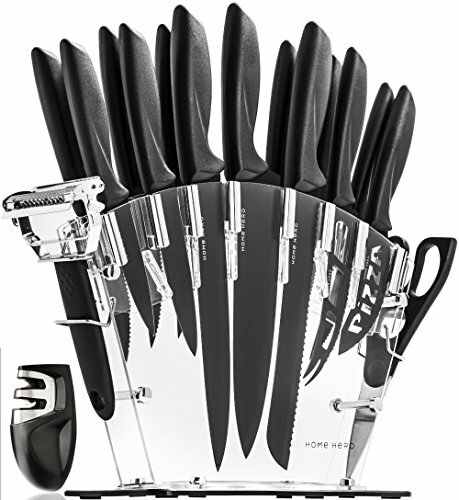 ✅ONE OF A KIND STAINLESS STEEL KNIFE SET - Home Hero brings together a unique mix of quality sharpness, great value, durability & professional crafted accuracy. Now anyone, newbie cook or master chef can enjoy cooking much faster, easier, cleaner. ✅100% MONEY BACK GUARANTEE - We're dedicated to enhance your cooking experience. Our aim: 100% satisfied customers. However, if you're not happy with your Home Hero Knife Set, you can return it anytime and get a full refund. We'll ask no questions. If you have any questions about this product by Home Hero, contact us by completing and submitting the form below. If you are looking for a specif part number, please include it with your message.